Our twelve year old and rather spritely Doberman called Milly absolutely adores broccoli. I don’t mind the florets but I find the stalks difficult; Milly waits eagerly for them to arrive in her bowl. She is extremely active for her age and breed and so I was fascinated to read an article about the work of a ‘homegrown’ (excuse the pun) university research group. Scientists at The University of East Anglia (UAE) in the UK have just launched a research project investigating the potential beneficial effects of broccoli in preventing the progression of osteoarthritis. If you have read some of our articles on arthritis or watched the videos, then you will know that osteoarthritis is generally a progressive condition. In dogs there is normally a TRIGGER but once in motion it is a self-perpetuating process of what amounts to ‘joint failure’. Some of the initial laboratory research at UAE found that a compound in broccoli called sulforaphane blocks the enzymes that cause cartilage deterioration. 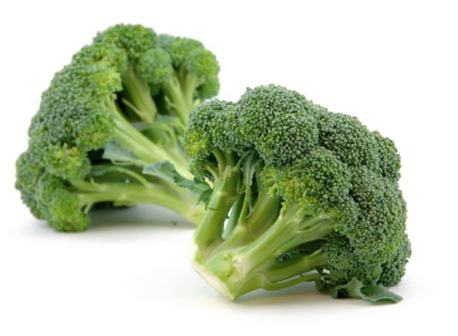 Sulforaphane is a chemical found in some vegetables, particularly broccoli. Eating broccoli leads to a high level of sulforaphane in the blood, but scientists don’t yet know if the sulforaphane gets into joints in sufficient amounts to be effective. This is one of the things that the UEA team hopes to discover. The research could lay the foundations for clinical trials involving large groups of patients to see if the laboratory effects are seen in ‘real life’. The UK group will also look at a chemical found in garlic that, in the laboratory at least, has also shown the ability to block some of the destructive enzymes active in osteoarthritic cartilage. As if that wasn’t enough to make you review your dislike of broccoli, this legume has previously been associated with reducing the risk of developing some cancers. Sorry Milly, I’m going have to get to like the stalks as well! If you want to add some broccoli into your dog’s diet then it may well have some benefical effects. Be careful though. Broccoli can be toxic if consumed in large amounts. I can’t find any evidence that the odd stalk would do any harm at all. Weight loss and osteoarthritis – better late than never…probably!